Quick Lane at Mel Hambelton is your neighborhood quick service and lube expert. We provide all the services your car or truck needs most, including an in-depth multipoint inspection. Car care services are performed by factory-trained experts. Quick Lane Tire and Auto Center offers quality auto service while you wait. Our factory-trained auto technicians and tire experts service all makes or all models. They use high quality Motorcraft replacement parts and lubricants that meet or exceed factory recommendations. 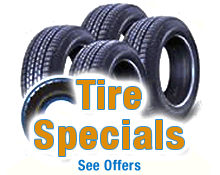 The Quick lane Tire Center offers all the top brands including Goodyear, Continental, Michelin, BF Goodrich and Yokohama.